One step ahead, always. This has been the way on the legislative and roads of the Netherlands with regard to the proper functioning of its cities and above all, its transport system. And is that if in the European country there are 17 million people, according to government counts, the number of bicycles far exceeds that figure: there are more than 22 million. During the next months, the Dutch government will seek to offer an incentive to all those who travel to work in this means of transport. The objective is to fight against the increasing congestion in its roads, highways and centers of the most important cities. The Government of the Netherlands is negotiating with the business sector an agreement for companies to start paying employees 0.19 euros for each kilometer that they circulate by bicycle from home to work, an incentive to further reduce the use of the car in the Netherlands and improve the health of workers. "My ambition is to ensure that people can easily go to work, to school, to see family or friends, and the bicycle contributes significantly to accessibility, livability and health, reducing traffic jams and making room for people who have no other choice," explained the Secretary of State for Water Infrastructure and Management of the Netherlands, Stientje van Veldhoven. The Ministry of Infrastructure and Water has set itself the goal of removing 200,000 drivers from the roads and thus increase bicycle traffic by the year 2040 as an objective. 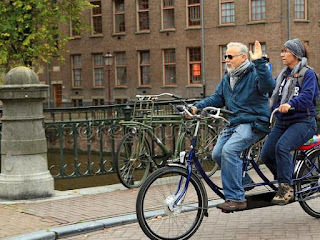 Van Veldhoven explained that he seeks to "stimulate cycling" and attract additional travelers to the bike lanes: "I want us to make together 3,000 million kilometers more by bike," he proposed. According to official figures, more than half of the trips by car in all the Dutch territory are less than 7.5 kilometers per day, a "good distance to make by bicycle", according to the Ministry. "I do 18 kilometers each way and another 18 kilometers back home, for me to be able to ride a bicycle is a marvel," says Alberto Brines, an engineer at a Dutch company in The Hague and resident in the neighbor Leiden. For him, this means of transport allows him to "take the time to exercise and be healthier" and at the same time use a "safe way to move because you do not run the risk of being run over", insists Brines, who remembers that Netherlands has "a great network of bike lanes". As a regular cyclist traveler, he explains that the companies in which he has worked in the Netherlands are "all prepared for the employees who come to the office by bicycle because they have showers, changing rooms and indoor parking". In addition, in a relatively small country, more than half of the workers live less than 15 kilometers from their workplace, which, for the laziest, is a distance "easy to cover, even with the help of advanced electric bicycles "whose use increases in this country year after year, according to Infrastructure. The Ministry is, among other issues, negotiating with the large national employers, multinationals based in the Netherlands and SMEs, on how "existing tax regulations can be used optimally" and thus offer incentives. As an example, Van Veldhoven has indicated the allocation of 0.19 euros per kilometer traveled by each employee and the reimbursement of the price of a new bicycle, something already offered by some Dutch companies. The Dutch government allocated 100 million euros this year in the budget to accelerate the construction of bicycle lanes and, above all, to innovate or build bicycle parking lots near public transport stations. The objective is to implement this economic incentive before the end of the summer. The issue of lack of parking is becoming increasingly evident due to the increased use of electric bicycles or cargo bicycles, which are larger than traditional bicycles. Another measure that the Dutch Government is promoting and which municipalities are implementing individually is the departure of motorcycles from the cycle lanes and their transfer to public roads and highways, with the obligation to use a helmet. Separating the motorcycle traffic will reduce bike jams at rush hour and the risk of accidents on the bike lanes. In the Netherlands there are more than 35,000 km of cycle paths and the country spends close to 400 million euros a year on bicycle infrastructure. The bicycle park amounts to 22.3 million bikes in the Netherlands, taking into account that the country has a population of 17 million people who make an average of 14 million trips by bike every working day.